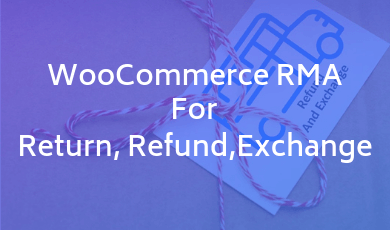 WooCommerce RMA For Return Refund and Exchange plugin is a complete solution for any kind of refunds and exchanges requests. It gives your customers an easy and simple way to apply Refund, Exchange, Wallet, Cancel Order requests and much more. The whole refund/exchange process goes under a proper mailing system. The merchant can enable/disable refund request feature. 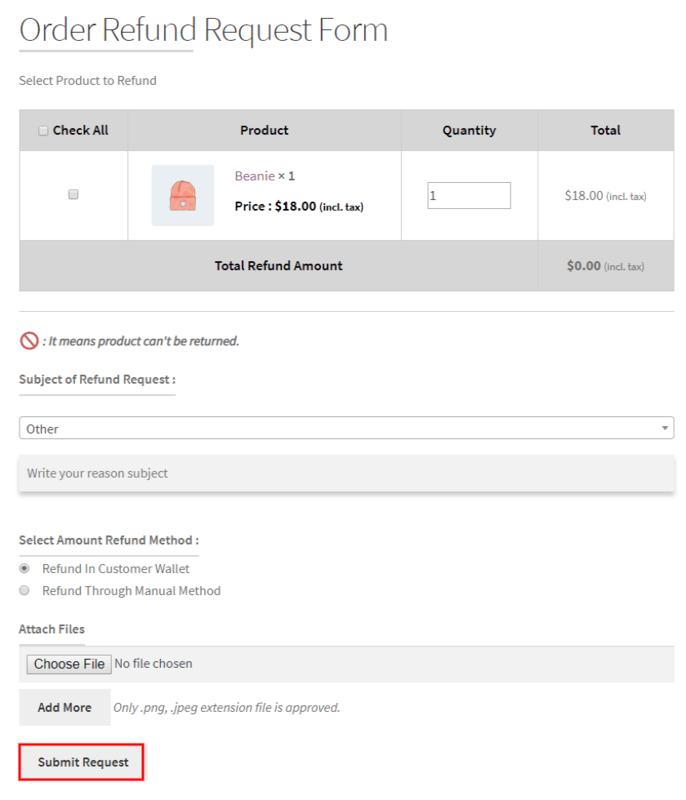 The user can submit multiple product refund request with reason. Add Refund Policy Setting according to Price and Time-Based Method. 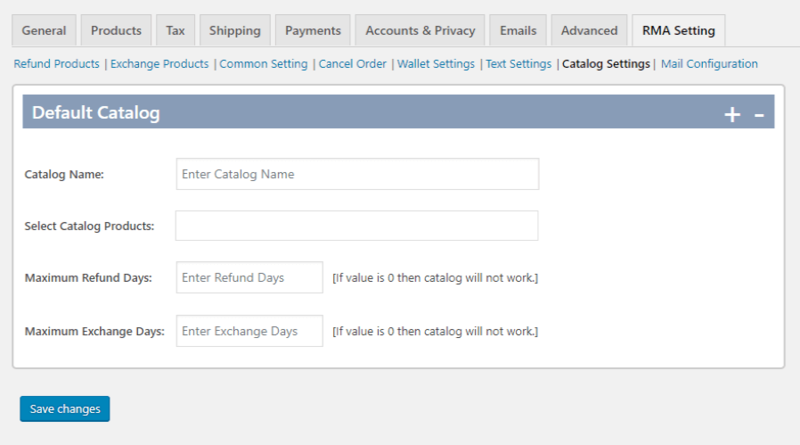 Add Catalog Settings for a set refund and exchange days of products according to the Catalog. 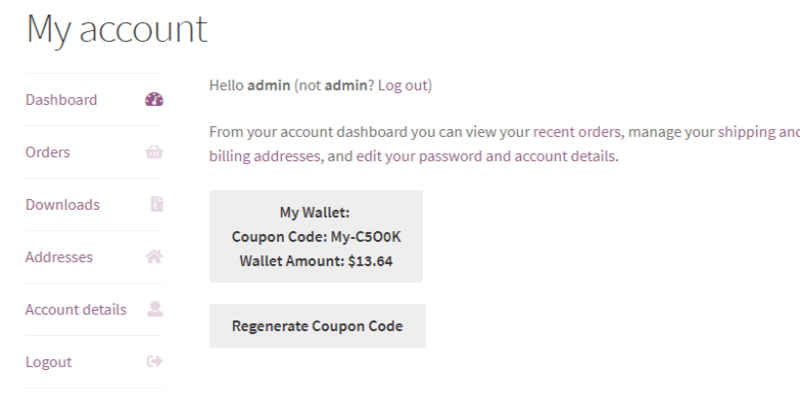 Add a Coupon Regenerator for allowing the customer to change the Wallet Coupon Code. Provide shortcode to display the Customer Wallet on any page. Allow to manage Customer Wallet from the user edit page. To add a payment gateway for User to make payment through their wallet. The merchant can enable customer wallet to save the refunded amount into customer wallet except to refund the amount. The merchant can manage stock for the approved request. The merchant can enable requests for selected order status. A user can pay an excess amount in the exchange process. The merchant can Customize refund and exchange mail content. Merchant and admin both notify by email for all events. Exchange feature is enabled for a selected number of days from order delivered. The user can submit multiple product Exchange request with reason. Merchant can enable/disable Exchange request feature. The merchant can prevent selected category product for the refund. 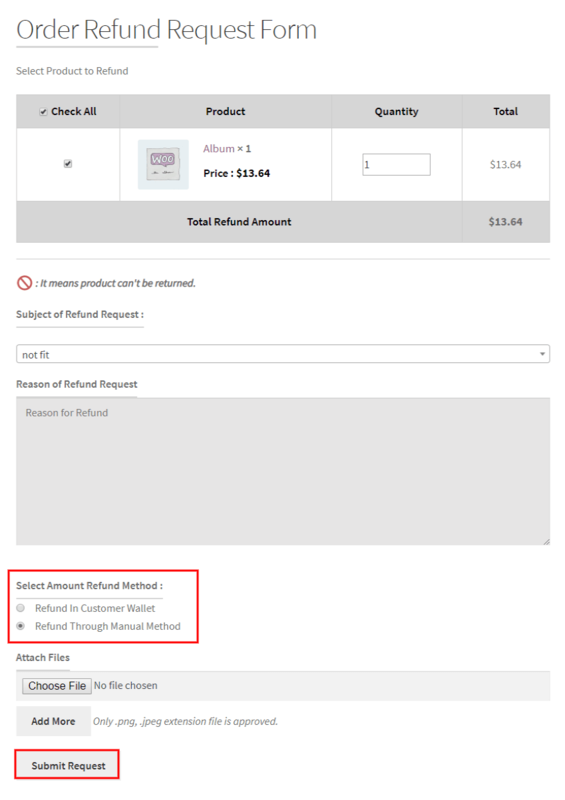 The merchant can exclude shipping cost for refund product. The merchant can disable refund feature for sale items. Refund feature is enabled for a selected number of days from order delivered. The customer can also exchange order in less old order amount and left amount refunded to the customer. Quantity will be updated on time of canceling the order. The merchant can also refund amount later in case of wallet disability. 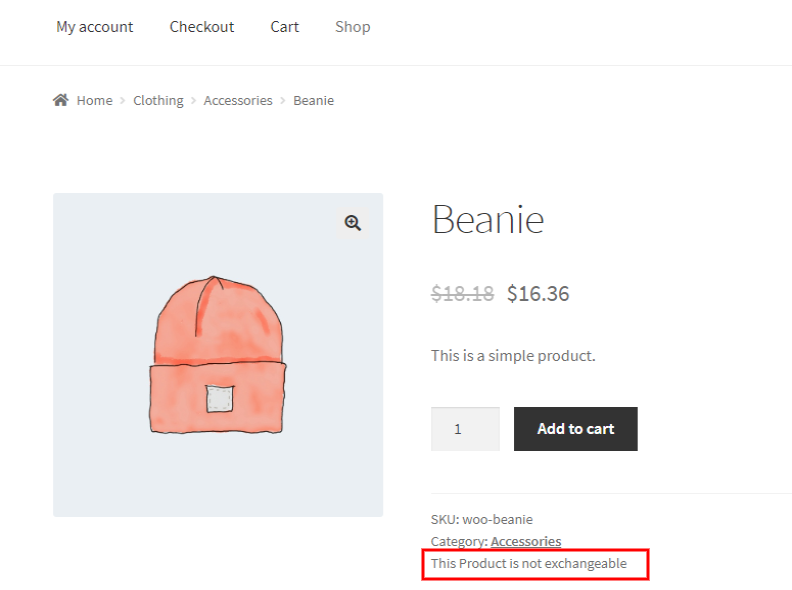 Allows the customers to cancel only the selected product instead of the whole order. Allow the merchant to exchange the product with the same product and it’s variations only. Refund product setting allows the administrator to enable the refund setting to your customer. For enabling this setting firstly you have to enable these three settings. Set the maximum number of days. Select the order status in which the order can be Refunded. 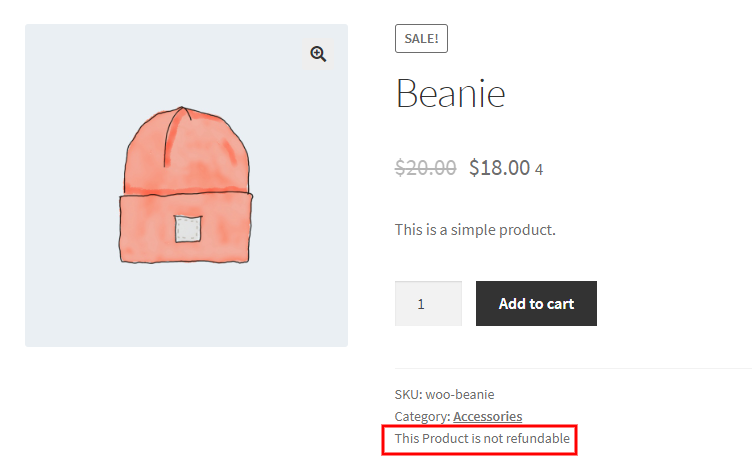 Your customers can see the refund button on the My Account Page ->Orders section. 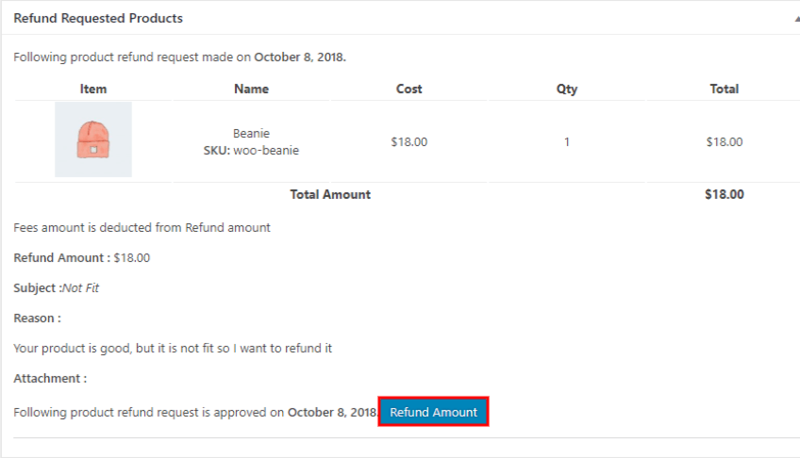 Clicking on the Refund Button, A Refund Request Form will display to the customer. After filling out this form your customer will be able to send the refund request to the admin. After Clicking on the Submit Request the Refund Request is transmitted to the Admin. Admin can see all the request requests from the WooCommerce > Orders. To view the detail information of any request by clicking on that particular product. Admin can check all the details of the product and Accept/Cancel the request. If the Admin accepts the refund request than refunds the amount in the customer wallet by clicking on the Refund Amount. 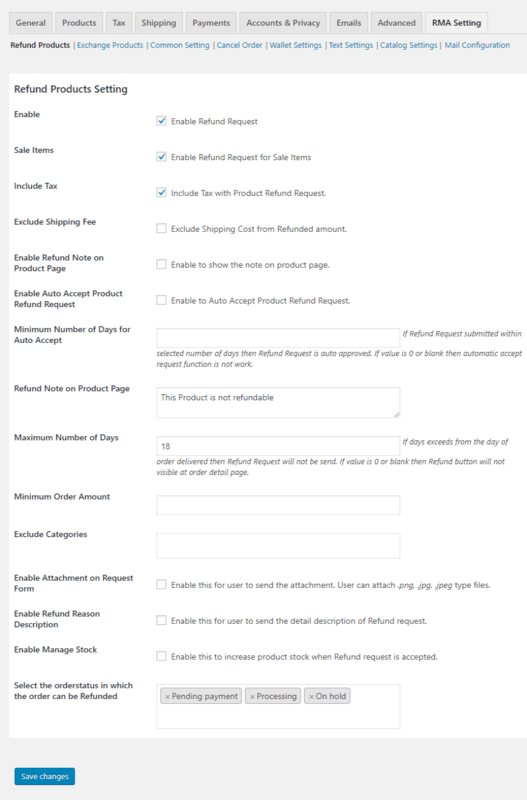 Through this setting, the administrator can enable the refund request for the sale items. The administrator can enable this setting to add tax amount with the product amount. Here you can see, the tax is included in the total amount of the product. Through this setting, the administrator can exclude shipping amount from the refunded amount. Here you can see, deduct some amount for refund process. To allow the ‘Auto Accept Product Refund Request’ you have to enable this setting and set the minimum number of days for auto accepting refund request. If Refund Request submitted within the selected number of days then Refund Request is auto-accepted otherwise rejected. If the value is 0 or blank then the Refund policy does not work. 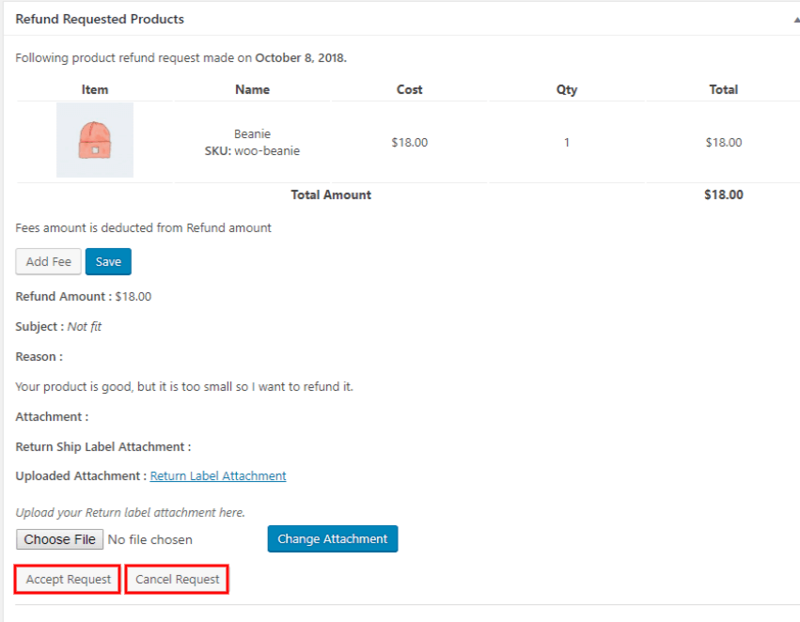 If you want to show any information related to refund request, Enable “Refund Note on Product Page” setting and write the message. This notification is applicable only on “Sale” items. The notification will be displayed on the product page. Enter some amount for the “Minimum Order Amount” tab. After enabling this setting, your customers refund only those order which cost greater than or equal to “Minimum Order Amount”. If the “Minimum Order Amount” value is 0 or blank then this functionality does work for all cost of the product. Here we can see, this type of notification will be displayed when amount of refunded product is less than the (Minimum Order Amount) required amount. Select those categories for which products you don’t want to refund. Through this setting, the user will be able to submit a refund request up to the selected number of days from the delivery day. If the value of this setting is zero or blank then Refund button will not visible at the Order detail page. Enable this setting for the customers to send the attachment with the refund request. they can attach .png, .jpg, .jpeg type files. Here your customer can attach files with the refund request. Enable this setting, If you want to your customer send the detail description with the Refund request. Here we can see that the description box visible with the subject. Enable this setting to manage the product stock after refund request is accepted. 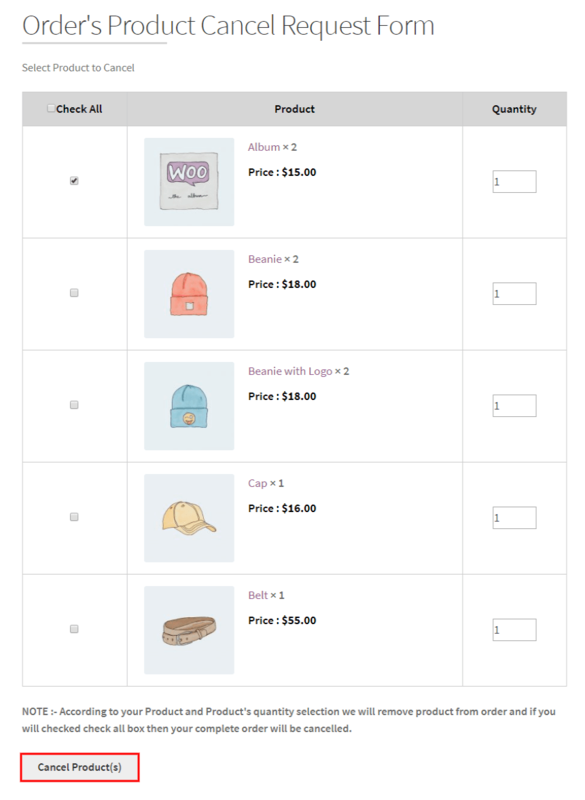 Here the admin can Select the order status in which the order can be Refunded. 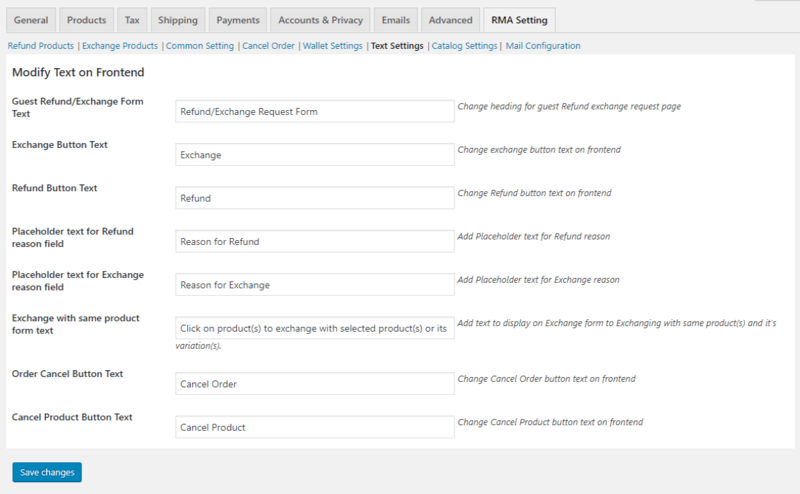 for example, admin select complete order status than only that product is refunded which hold complete order status. Exchange product setting allows the administrator to enable the exchange product setting to your customer. For enabling this setting, you must enable these three settings. Select the order status in which the order can be Exchange. 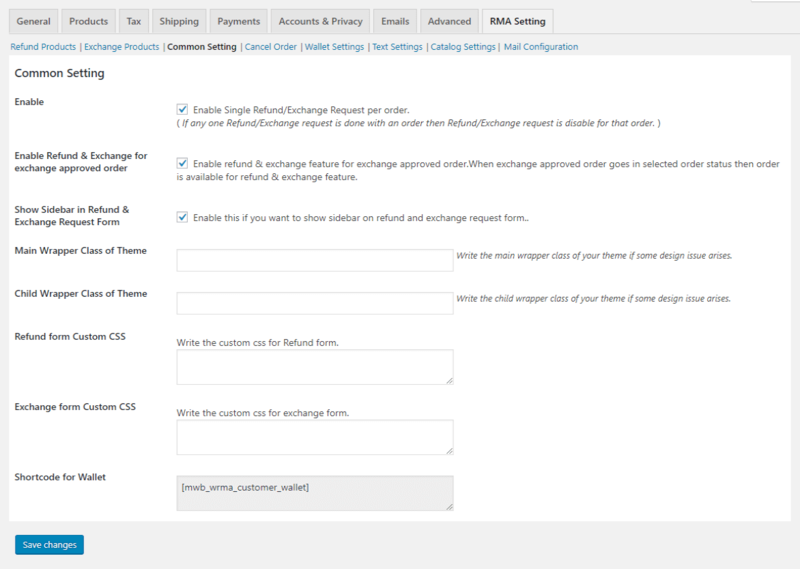 After enabling the setting, your customer can send the exchange request by following steps. First Click on the “Exchange Button“. After clicking on the “exchange button”, A Exchange Request Form will be displayed. After filling out this form the customer will be able to send the exchange request. Admin can allow the customer for two type of exchange policies. Exchange product with selected products or its variations. Exchange the product by any product. After Clicking on the Submit Request, the Exchange Request transmits to the Admin. The Admin can see all the exchange request from the Order list. View any request by clicking on that particular request. The admin can view all the details of the product and Accept or Cancel the exchange request. If the admin accepts Exchange request then manage stock by clicking on “Manage Stock” button. 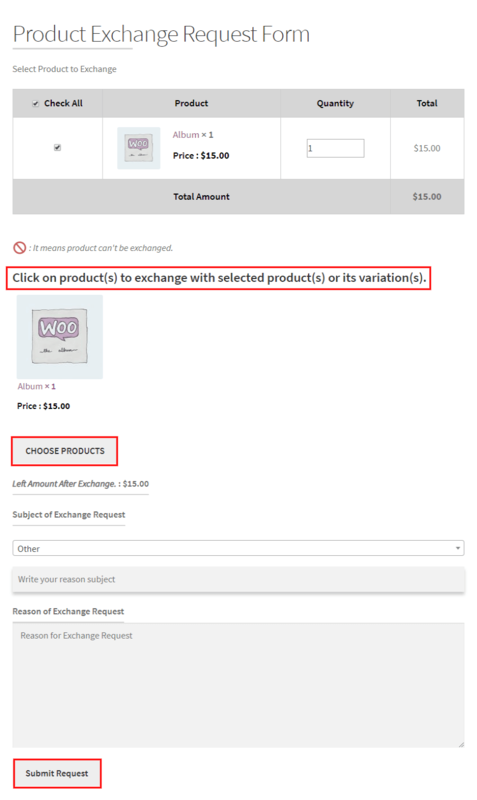 Enable this setting, If you want to allow your customer to exchange the product only with the same product or its variations. Here you can see your customer can exchange the product with the same product or its variations. Through this setting, the administrator can enable the exchange feature for the sale items. The administrator can enable the setting for include tax amount with the exchanged product amount. Here you can see, the tax is included in the total amount of product. 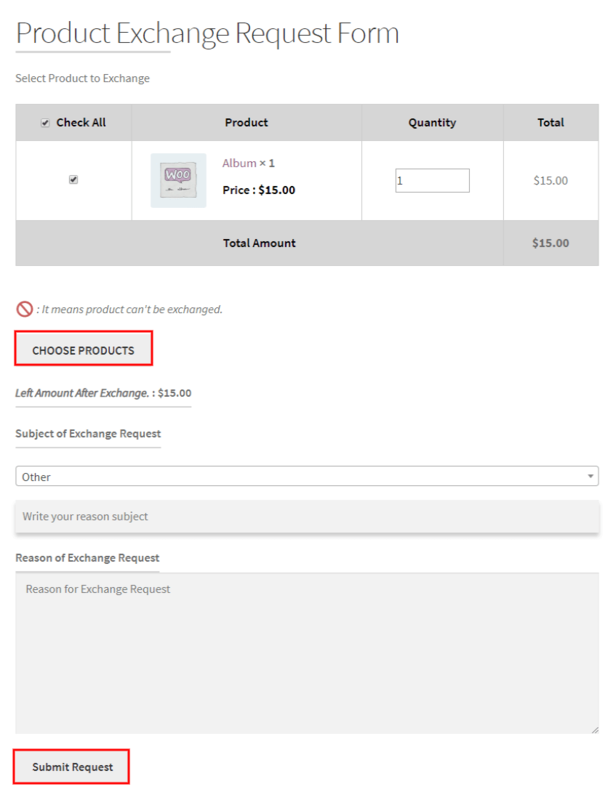 Through this setting, the administrator can exclude shipping amount from the exchanged product amount. On the Order detail page, admin adds some amount for the exchange product with the fee name. If you want to show any information related to Exchange request, Enable the “Exchange Note on Product Page” setting and enter the message. This setting is applicable only for the “Sale” products. Enter the valid number of days for the Maximum Number of Days, If the value is 0 or blank then the exchange button will be hidden from the order page. Your customers will able to send the refund request within the selected number of days unless the Exchange button hidden from the order page. If the value is 0 or blank then the exchange functionality does not work. If you enter some valid number in the “Minimum Order Amount”, then your customers exchange only those products which cost greater than or equal to that amount. If the value is 0 or blank then this functionality does work for all cost of exchange request. Here you can see, The notification will display when the exchanged product’s amount is less than the (Minimum Order Amount) required amount. Select those categories for which products you don’t want to exchange. Enable this setting, if you want to show the “Add To Cart” button at the time of exchange session is started. “Add To Cart” button will display with the “Exchange Button”. Enable this setting for your customers. If you want, your customer sends a detail description with the Exchange request. Here we can see that Description box will visible with the Exchange Form. 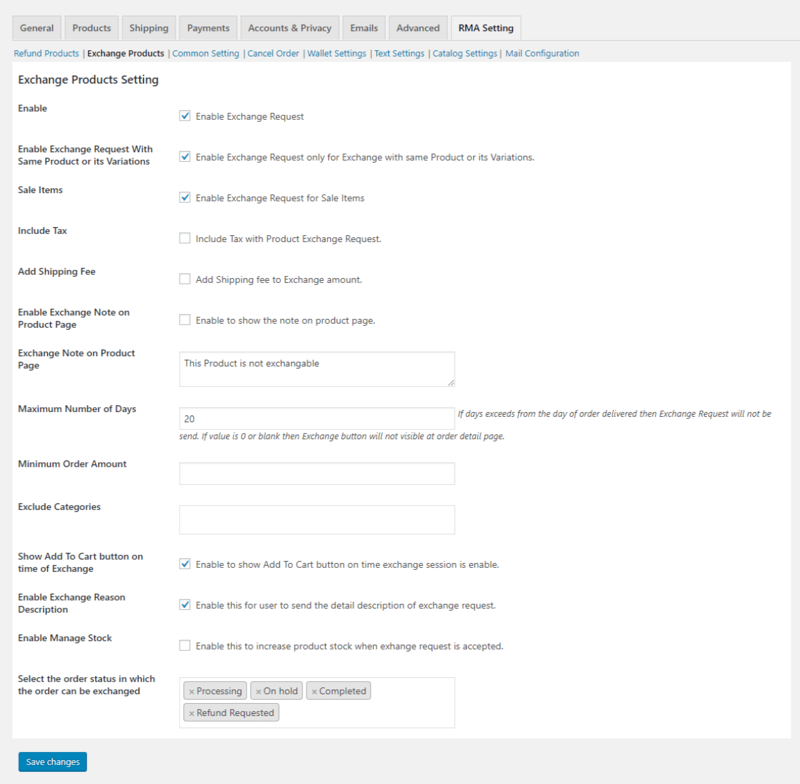 Enable this setting if you want to automatically manage stock when any exchange request is accepted. After accepting the exchange request, the admin can manage stock by clicking on the “Manage Stock”. Select order status in which the order can be exchanged. This setting will work for both Refund and Exchange Requests. After enabling this feature the merchant can recommend one request for an order, If anyone Refund/Exchange request is done with an order then Refund/Exchange request is disabled for that order. Enable: This setting will work for both Refund and Exchange Request. 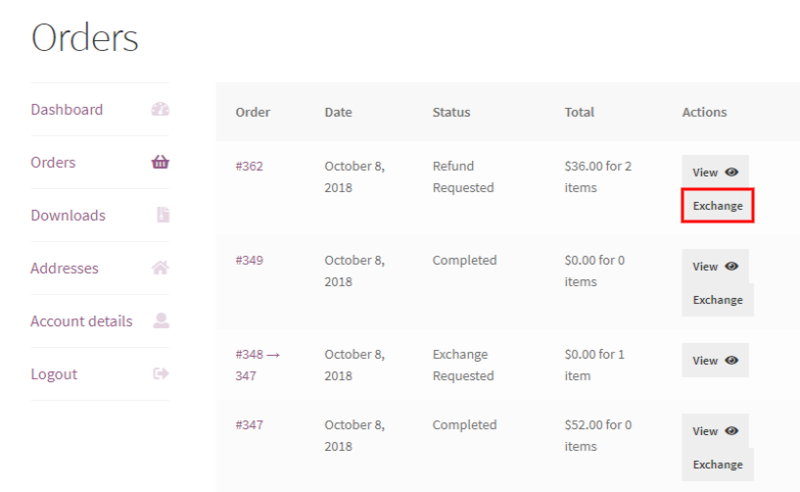 After enabling this feature the merchant can recommend both refund/exchange requests and If anyone Refund/Exchange request is done with an order then Refund/Exchange request is disabled for that order. 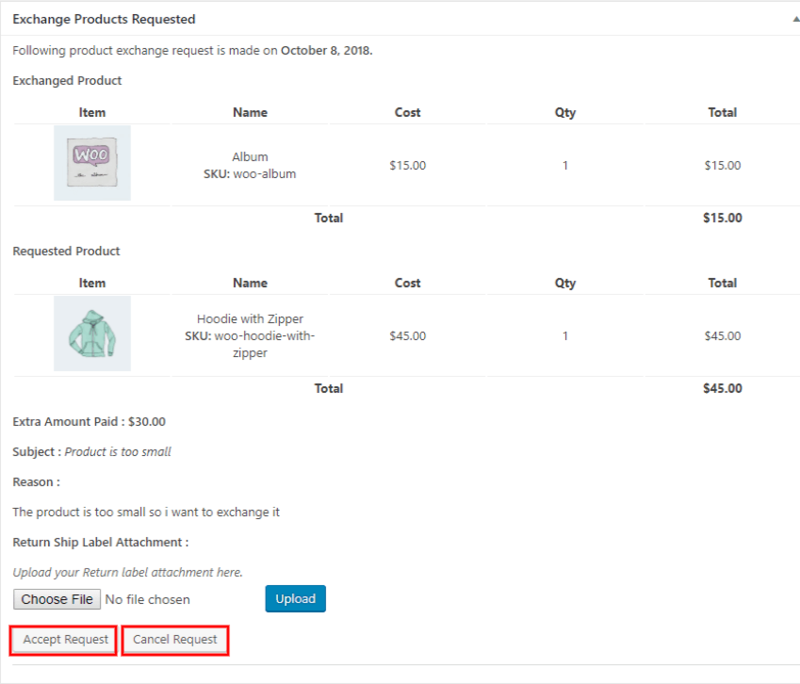 Enable Refund & Exchange for exchange approved order: Enable this setting if you want to again enable the refund/exchange setting on the exchange approved product. Sidebar: The merchant can enable the settings for showing the sidebar in refund and request form. Admin can Write Main Wrapper Class & Child Wrapper Class of Theme if add some design on the frontend. Custom CSS: The merchant can change the physical properties of refund from, exchange form, wallet using the custom CSS. 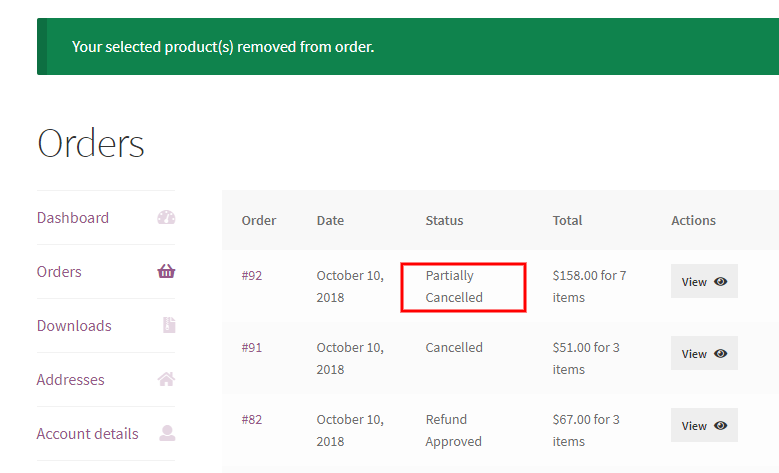 If you want to your customer can cancel their products after purchasing, then enable the Cancel Order setting. Through this setting, the customer can send the Cancel Order request by clicking on the “Cancel Order” button from the My Account > Orders section. 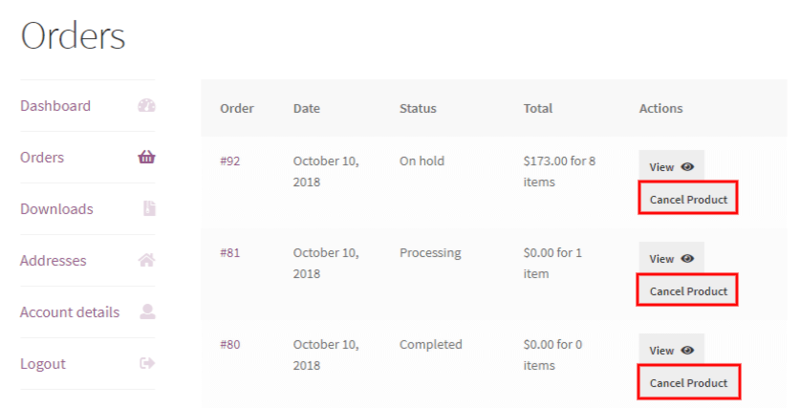 Click on the “Cancel Order” button to Cancel the Order. After clicking on the “Cancel Order” whole product will be canceled and a notification will display on Page. 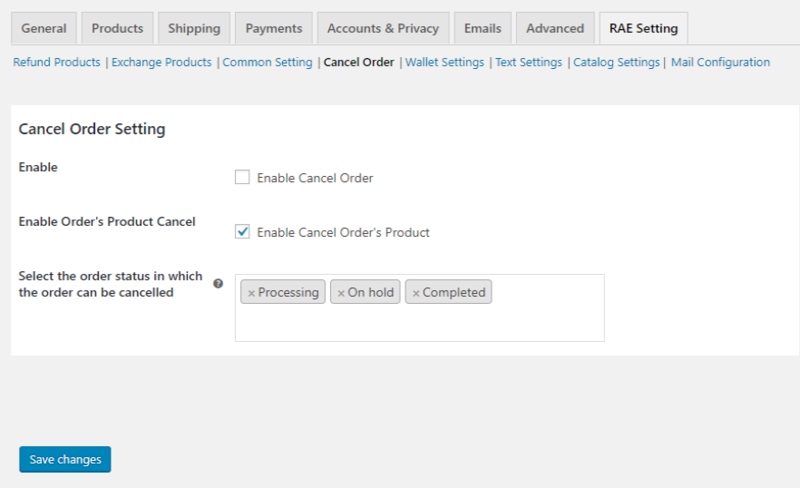 Enabling this setting, the admin can allow the customer to cancel only the selected products instead of whole order. 2- Click on “Cancel Product” button. 3-Select those products which you want to remove from the order. 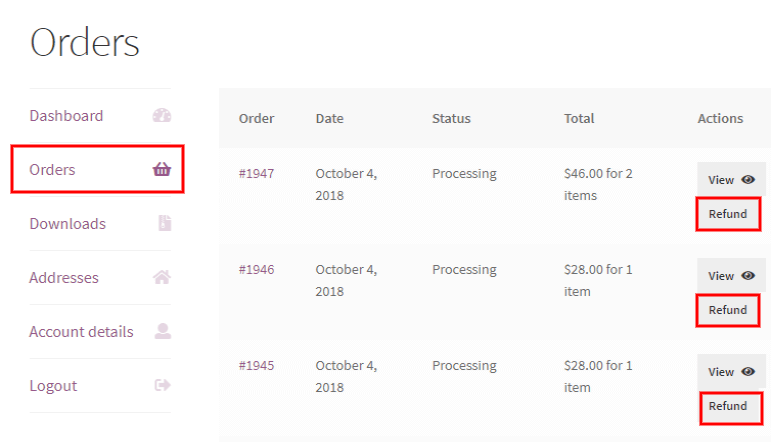 4-Click on the “Cancel Product” to remove the selected product from the order. After successful deletion of the product, a notification will be displayed. If you want to add the refunded amount to the customer wallet than enable “Wallet settings”. After enabling this setting the refunded amount will automatically add to the customer wallet. Here You can see the refunded amount has been added to the “customer wallet”. 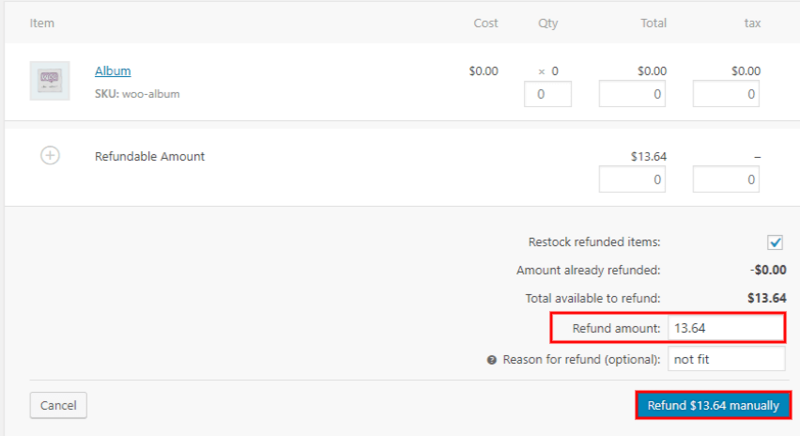 Enabling this setting if the Admin wants to allows the customer to select the refund method. There are two types of refund methods. If the customer selects the refund method is Refund Through Manual Method than Admin refunds amount through the manual process. Here admin enters the refund amount and clicks on the “Refund Manually”. 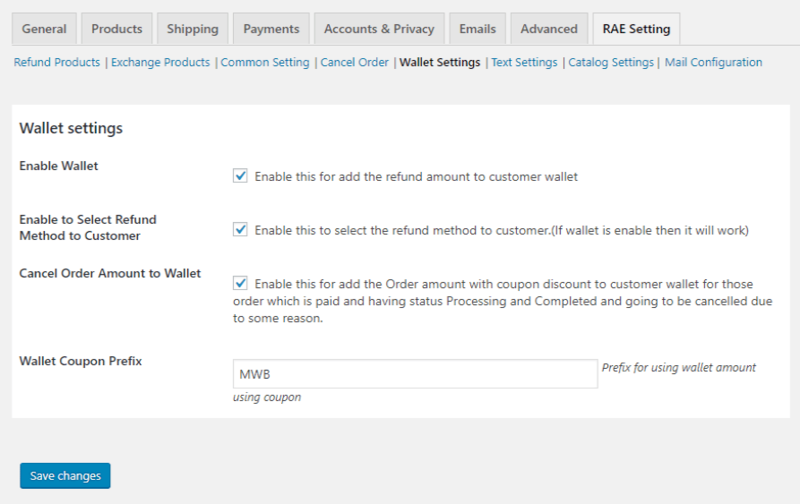 If the customer selects the refund method is “Refund in Customer Wallet” than refunded amount automatically adds to the customer wallet after approving the refund request. Admin can modify the frontend text through these settings. 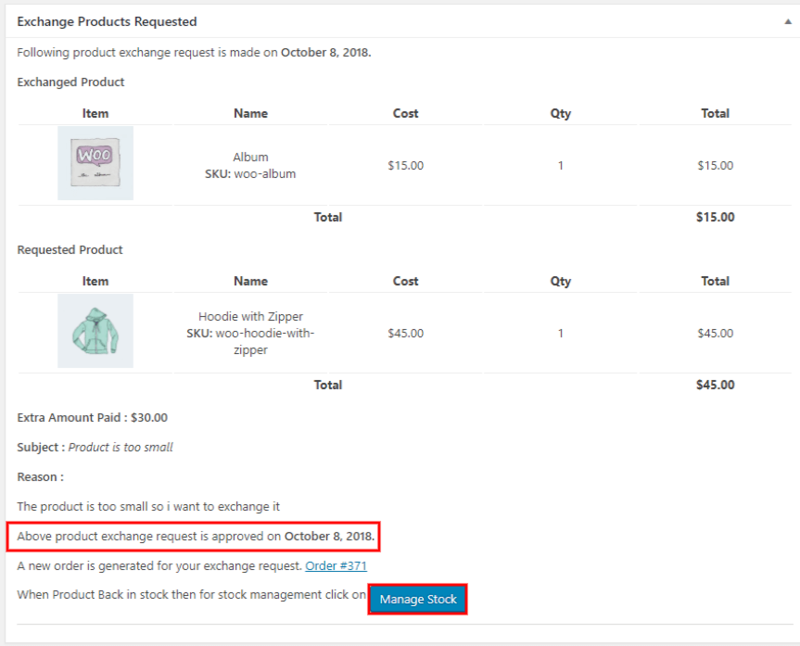 Through this setting creates Catalog and select those categories on which categories products you don’t want to allow refund and exchange request for the selected time of period. Add/Remove new catalog after first. Here Merchant can give Name of products group. Here select products of catalog group. Set maximum Refund Days of the selected Products. Set maximum Exchange Days of the selected Products. This page is basically for notification. From Name: All email notification to the user is sent from this name. From Email: All email notification to the user is sent from this email. Predefined Refund Reason: Merchant can set multiple Predefined refund reason which may be the reason of Users. Predefined Exchange Reason: Merchant can set multiple Predefined exchange reason which may be the reason for User. Merchant Refund Request Subject: Subject of refund request which Merchant received for an Order. Refund Request Received Subject: Subject of refund request which user received for their Order. Received Refund Request Message: Message content of refund request which user received for their Order. Approved Refund Request Subject: Subject of the approved request which user received for their Order. Approved Refund Request Message: Message content of the approved refund request which user received for their Order. Canceled Refund Request Subject: Subject of the canceled request which user received for their Order. Canceled Refund Request Message: Message content of canceled refund request which user received for their Order. Enable to custom email template: Enable this when you want to put custom email template in the editor and put your email template under the text tab of the editor. Merchant Exchange Request Subject: Subject of exchange request which Merchant received for an Order. Received Exchange Request Message: Message content of exchange request which user received for their Order. Approved Exchange Request Subject: Subject of the approved exchange request which user received for their Order. Approved Exchange Request Message: Message content of approved exchange request which user received for their Order. Canceled Exchange Request Subject: Subject of canceled exchange request which user received for their Order. Canceled Exchange Request Message: Message content of canceled exchange request which user received for their Order.